Comcast, Verizon, and Disney have reportedly approached 21st Century Fox to buy some of its assets. Disney had approached 21st Century Fox to discuss a purchase of its movie and TV studio and some cable networks, according to reports last week. 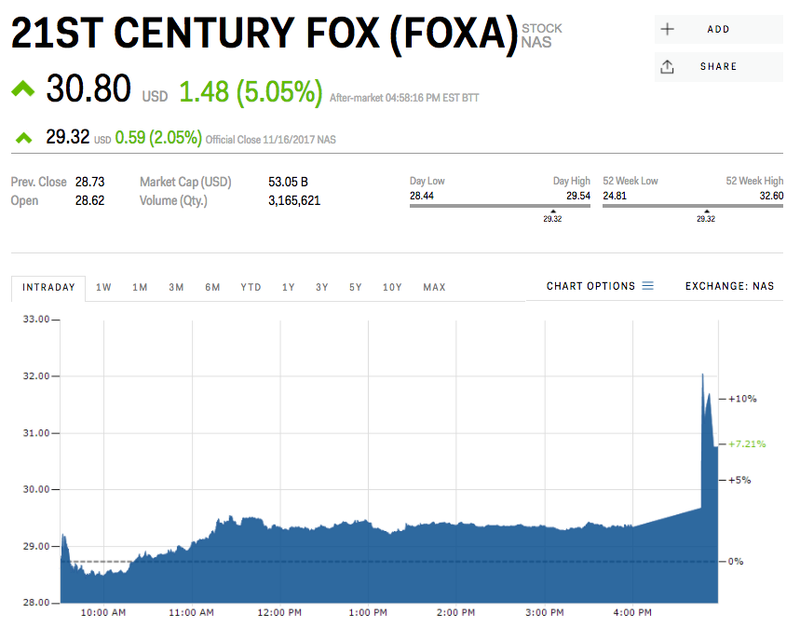 21st Century Fox shares gained 6% after-hours on Thursday. Comcast and Verizon have approached 21st Century Fox to buy at least part of the company, CNBC and The Wall Street Journal reported on Thursday. The news comes about a week after CNBC reported that Disney was recently in talks to buy most of 21st Century Fox. It signals that the three companies may engage in a bidding war for the $US54-billion owner of the Fox News Channel, controlled by Rupert Murdoch. The reported offers come amid rating declines across many large cable networks as more consumers opt for cheaper and more customisable web-based services. A deal with Disney would have further trimmed 21st Century Fox’s assets into a more focused slate of news and sports networks to better compete in a changing media landscape, the report said. 21st Century spun off News Corp., its publishing business, in 2013. The acquisition would have excluded Fox News because Disney cannot own two broadcast networks. Disney bought ABC in 1996. 21st Century Fox would reportedly have kept its sports channels to avoid the regulatory scrutiny that would come with a tie-up with ESPN. Disney was reportedly interested in buying Fox assets including its studio division, partial ownership of the UK telecoms company Sky, and networks such as National Geographic and FX. 21st Century Fox shares jumped 6% in after-hours trading on the news, while Comcast rose 1%.